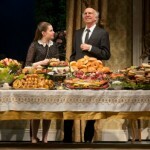 Family feuds aren’t exclusive to Jewish families, but they do seem to do it so well – remember radio’s the Bickersons? 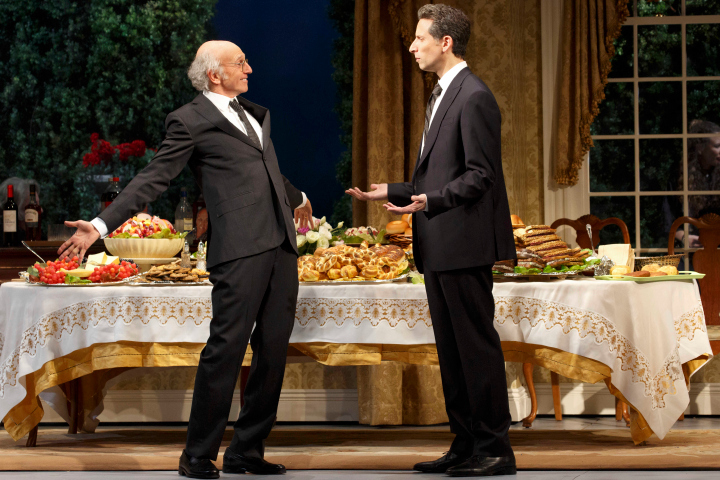 So here comes Larry David of Curb Your Enthusiasm and Seinfeld fame, bringing his very specific brand of comedy to the Broadway stage, both as playwright and star with Fish in the Dark. He’s the great neurotic of all time as he gesticulates in his mime-like persona that makes the audience roar with laughter. Death and dying and who is mama gonna live with after dad dies, make for outrageous fun if you’ve got a mind like David. Think TV sitcom on a Broadway stage. In the kugel, is a mix of characters: Norman Drexel (David) who’s in the urinal business, his big time lawyer brother Arthur (Ben Shenkman), who brings his new oversexed girlfriend (blonde voluptuous Michelle – Jenn Lyon) to visit his dying father in the hospital, Norman’s nagging wife Brenda (Rita Wilson), who can’t stand her mother-in-law, Gloria, (only a son could love her – the perfectly cast Jayne Houdyshell) and an assortment of relatives who seem all too familiar. The play opens with a scrim of a Death Certificate that slowly gets filled in as the show moves along, as we find the patriarch Sidney Drexel (Jerry Adler) on his deathbed, the relatives gathering in the hospital for a last visit as the inappropriateness of the conversation is highlighted by who gets what with shouts and lies in their efforts to get to first place. Did Sidney really promise his gold Rolex watch to his yappy sister Rose’s (MaryLouise Burke) annoying husband Harry (Kenneth Tigar)? There is no political correctness here as racial slurs and more fly, especially from Sidney’s loudmouth brother Stewie (Lewis J. Stadlen). There’s no limit to the arguing – should Sidney be on a ventilator and who’s gonna ask him; Norman, Arthur or the Doctor? From Arthur’s standpoint, why pay an arm and a leg for a casket when it costs less to cremate. So what does Gloria have against Brenda all these years? It must be that wool scarf she gave Brenda that she never wears because it itches, or maybe it was that dimly lit fish dinner? Hmmm. And then there’s the housekeeper Fabiana (a terrific Rosie Perez) who has worked for Gloria and Sidney for many years and, boy, what a secret she has kept. 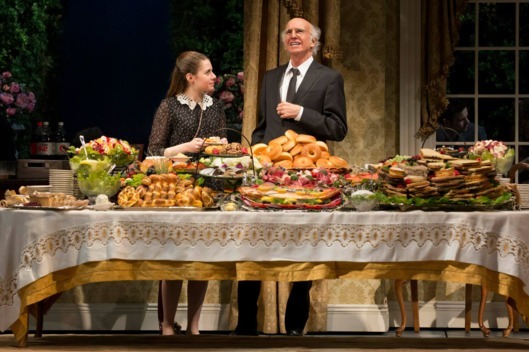 Suffice it to say that her adorable son Diego (Jake Cannavale – yes he’s Bobby’s son), plays a major role in the second act as the scowling Gloria suddenly lightens up, singing and smiling, seeing life anew. 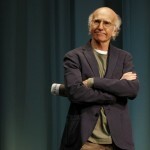 Larry David has spread the wealth of comedy around to his cast mates as they all have joke lines galore. Molly Ranson, who plays Norman and Brenda’s daughter, Natalie, is adorable as she readies in cockney accent for a role in a local My Fair Lady production, her boyfriend Greg (Jonny Orsini) almost blows his relationship with her when he offers advice to Norman about tipping doctors and Arthur’s 14 year old daughter Jessica (Rachel Resheff) becomes immediate competition to Norman when she offers up a better eulogy at the funeral. Director Anna D. Shapiro carefully moves these characters about with aplomb in Todd Rosenthal’s fine set, and has done a yeoman’s job making David realize he must stick to a script – no improv here. Now David just has to relax and enjoy the moment so he doesn’t appear so uptight. 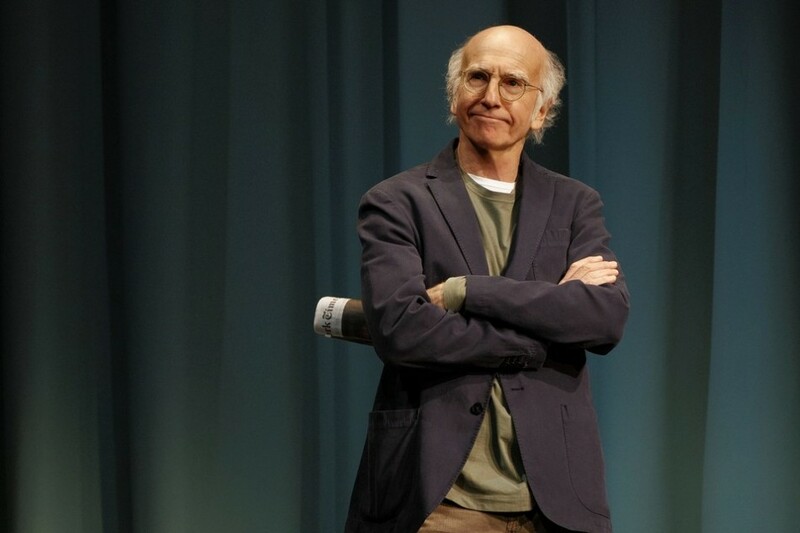 But keep in mind, that although this is a tough ticket to score (mostly sold out) you have to be a big time Larry David fan or this won’t work for you.